Technology is constantly evolving, as online commerce continues to grow, the call center is often the first point of contact your customer encounters. A great call center is the first step in great customer service. 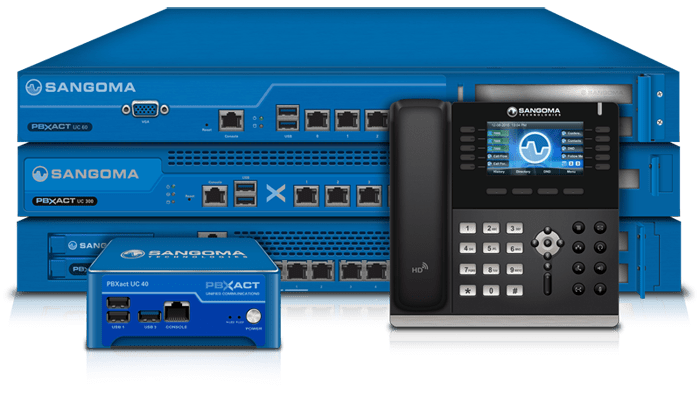 Sangoma’s PBXact phone systems are the perfect tool to help you build your call center and give you an edge on your competition. What are PBXact Phone Systems? Sangoma’s PBXact phone systems are the backbone for your call center solution. They are made specifically for organizations that require a full featured, commercially supported, business communications turnkey solution. PBXact comes with an extensive set of Unified Communications features to help call centers succeed. Such as “Phones Apps” for Sangoma or third party IP Phones, Unified Communication Panel (UCP) for individual user end-point management and Zulu UC Desktop Integration with Softphone and CRM Helpdesk integration. With the Queue Pro module, callers can optionally disconnect their call once they are placed into queue and retain their position. With Virtual Queues you can assign dynamic queue penalty rules to escalate calls based on the length of hold time. Insert a custom message in your IVR to greet inbound callers with special messaging to advise them of news. Great for service outage periods. Enrich a call-in customer’s experience by periodically notifying them of their position in the queue. The Web Call Back Module allows you to easily add an HTML “call me” box to your website. Visitors simply put their phone number in to be connected with you, or a specific destination. Insert standard or custom greetings for your call-in customers. Direct dial capabilities also allow special callers to break through to a special extension. The Queue priority feature allows you to prioritize specific customer groups above others (such as your sales callers over technical support callers). Automatically move longer waiting customers to roll-over queues which have more available staff to takes calls. Caller-ID-Name prefixing, multiple ring strategies, agent announcement and more. Send inbound callers to different IVRs based on time of day. Great for after hours callers who can reach an outsourced IVR located in a different region. Unique way to automate appointment confirmations, cancellations and reschedules. By simply specifing numbers and names to be called PBXact will automatically call at specified times and allow recipients to confirm, cancel and reschedule appointments. Create automated outbound dialing campaigns to save you money. Upload CSV files and use the built-in scheduling and routing to route calls based on human or voicemail response. Also the Outbound Call Limiting Module protects your business from over-dialing restrictions based in your region. Q-Xact Reports provide management with reports for call distribution, service thresholds, disconnects and more, all from the PBX Web GUI Call Recording reports help guarantee customer satisfaction with easy to use Web GUI driven search and filter capabilities with built-in archiving.